I don’t drive. Crazy, I know. Even coming from Hobart, living 20 minutes by car from the CBD, or 40 minutes by bus, I’ve never really found the need. And if I didn’t need to drive in Hobart, where everywhere is at least a good twenty minutes away by car, then I probably wasn’t going to need to drive when I moved to Brisbane, a city with vastly better public transport infrastructure than Hobart. But for a little while now, I’ve wanted to explore Brisbane. I’ve visited all the big shopping centres, walked through all the Westfields, and now feel as though it’s time to branch out. As much as I like walking, walking has two major downsides. For starters, it takes a long time if you want to go anywhere, and walking outside in Brisbane heat might as well be classified as self-harm. So for the past couple of months, I’ve been asking myself: how do I get around Brisbane that isn’t walking or driving? Biking is the most obvious answer. You could probably pick up a semi-decent bike for under $1000, and would easily satisfy any kind of personal transport you had. While I’ve always been impartial to biking, I’ve never owned a nice bike, so now is probably not the time to start. Besides, the thought of having to ride on the road, alongside cars, is kinda scary. Yes, I know bike paths exist, and Brisbane has some very nice bike paths that look increasingly tempting and very rideable, but there are a few things that keep me from going all-out and buying a nice bike. If I’m going to get a nice bike, I’m probably going to want some kind of return on investment. It seems crazy to have a really nice bike only to ride it on the weekends, which means I’m probably going to want to ride to work. But what kind of person voluntarily does hard physical exercise for 20-30 minutes, twice per day, in anywhere between 25º and 35º heat? Even if my workplace has great after-trip facilities, there’s no getting around the fact that I’m going to arrive at work as a gross, sweaty mess every single morning. Nobody wants that. Besides, some quick maths says that a nice $2000 bike, at current public transport prices, is going to take over a year of riding to work before it pays itself off. And if I’m being honest, “biking culture”, if we’re calling it that, is a little too serious for me. Strike bikes off the list, at least for now. What about an electric skateboards? They’re all the rage these days. Even if they seem a little “how do you do, fellow kids”, they’re actually super cool. The two most popular names, Boosted Boards or Queensland’s own Evolve, are definitely not for the faint hearted. A guy I know has the Evolve Carbon GT, and it’s basically the Ferrari of electric skateboards, with carbon fibre construction and an insane 1500W behind each rear wheel. Unfortunately, the Evolve Carbon GT, being the Ferrari of electric skateboards (after seeing it you’d want nothing else), comes with a price tag to match; the all-terrain model comes in at a touch under $2000, and for that money you could get a very sweet bike indeed. So cross electric skateboards off the list, too. Which is where the Xiaomi M365 comes into play. The M365 was perfect. Not overly flashy, but capable enough of getting me from A to B. It was the cheap and cheerful alternative to whatever else I was thinking of buying, and for a while there, was the thing for personal transport. I can only begin to describe what it felt like, scooting around the local neighbourhood, on my way to the shops to pick a few things up, or feeling the wind in my face after a long day at work. When it was good, it was great. That’s “ecstasy”, or at least was. Unfortunately, long-term reliability issues made the M365 less appealing than what I originally thought it was going to be. I ended up clocking less than 200KMs on that thing, which seems like a terrible shame for how much I spent on it. While it’s entirely possible that later revisions have fixed the problems I (and many others across the world) have experienced, that’s kind of the price you pay for being an early adopter of a new and groundbreaking method of personal transport from a company with no proven track record in the field. What about a regular skateboard? Too pedestrian. 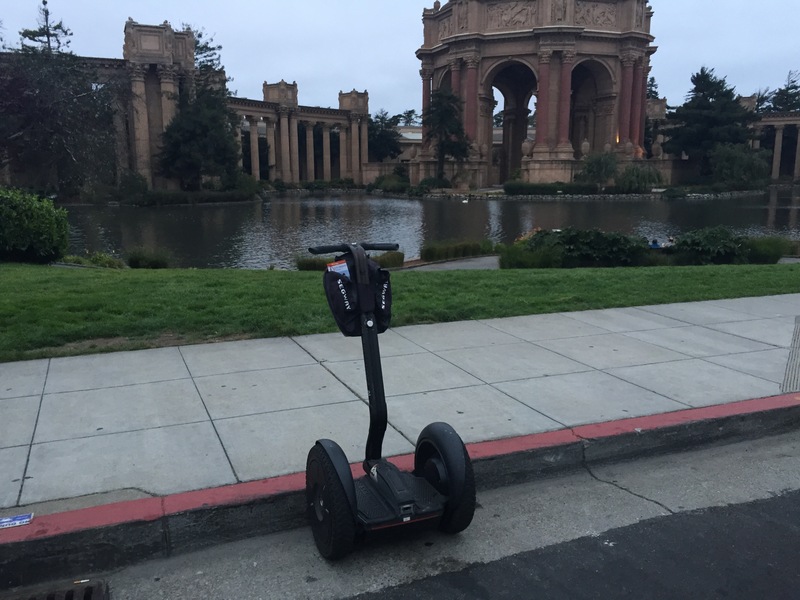 A Segway? Too nerdy, even for me. An electric bike? Too expensive. A Vespa? Good heavens, no. In light of any real options, it looks like the jury’s still out on what the most suitable of personal transport is. In terms of daily commutes, I’m pretty lucky. It’s a short 2.5 KM walk between home and work. If I don’t feel like walking (which is, if I’m honest, all the time, even when it’s not 30ºC before 9am), work is just one train stop away, and living closer to the CBD than my work is means that I’ve never had to deal with the hell that is a packed train during peak, as fun as my colleagues tell me that sweat-pit sardine experience is. All of this will change next year when I move. My daily commute via public transport will go from 15 minutes to somewhere in the 40 minute range, and to make matters worse, I’ll have to switch transport methods along the way; either taking a bus then a train, or a train then a bus, or two busses. This particular public transport debacle probably could have avoided if I chose a better location to buy my own place, but eh, that’s just how it goes. It’ll have to do. I figure if I’m going to invest in some kind of personal transport to make my daily commute a little easier, I might as well do it now while I have an easy commute. Unfortunately, even though my commute will take longer, I shouldn’t be paying any more for it after I move, so I might as well get something now so it can start paying for itself while I have an easy commute, instead of next year when I have a terrible commute. My head says I should get a bike. It’s the practical, sensible option. I’ve got most of the bits I need for practical commuting and some I don’t, including clip-in pedals and shoes, and would really only need a rack to store a change of clothes in two and from work. On the other hand, my heart wants an electric skateboard. It’s the cool, fun option. There’s no risk of suffering from heat-related injuries during my everyday commute, I don’t have to worry about bike maintenance or the potential of a flat when I’m halfway into my ride, and if I buy an Evolve, at least I’ll have some kind of local warranty if things go wrong. All I know is, I’ve been thinking about this on and off for the past few months, ever since my electric scooter died, and I’m still no closer to a decision. That’s agony.